I got to work on the new Ruger AR-556 rifle this week. To properly refinish a firearm you should 100% take it apart down to the last pin. Even though it was a brand new rifle this is what a professional gunsmith would do. Having taken one apart now, I will tell you that I am impressed with this rifle and its build quality. Everything about this rifle is on par with any sub 900.00 rifle you could name. I know all over the internet on firearms forums people have written this rifle off because of the price point. But everything about this rifle was smooth and well put together. Now the rifle is not Mil-Spec but it does not claim to be. Arm chair commandos will point out what it lacks. But me I come from the opposite end. I work on these things and for this gun being in the 500 - 600 dollar range it is an honest value. For the person who needs a reliable rifle, for sport or self defense don't overlook the AR-556. Not everybody needs a rifle that has to meet the demands of Afghanistan or Iraq. Sometimes a Honda Accord will do the job and thats just what this rifle is. It will put a smile on your face and punch nice tight holes in the targets all while giving you great reliability. 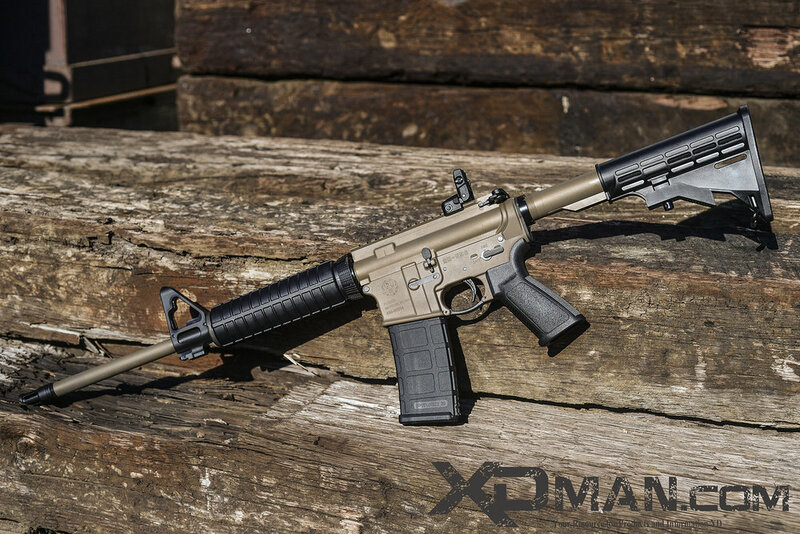 For this project we refinished the Ruger AR-556 in Anodized FDE KG Gunkote. This particular project cost the customer 150.00 for refinishing in one color. If you are interested in getting some work done contact us and let me know what your looking for. The picture above highlights what I love about KG Gunkote. Just open the picture up and look really close at it. Look how crisp and clear all of the engravings look even after coating. 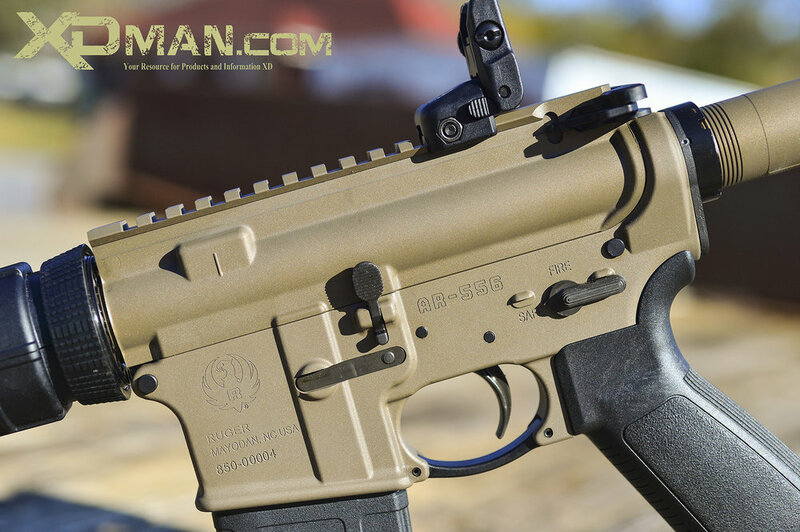 One of the noteworthy points of discussion about the AR-556 is the front sight post. It is a fully machined front sight post. On the user side of things the front sight post is usable and clean. On the gunsmithing side of things I want to point out that the barrel and front sight will not be compatible with other barrels or front sight posts. Notice that the taper pins are located on the top side of the barrel. On normal Ar's these two pins are located on the bottom side of the barrel. What this means is that you will not be able to just change the barrel if you want to. Now you can replace the barrel and front sight/Gas block both at the same time and reuse everything else. Or have your new barrel cut for the taper pins on the top. Either way if you want to change out the front sight/gas block or barrel you will have some difficulty. Another interesting part of the AR-556 is the "Delta Ring". In the AR-556 the barrel uses a barrel nut like one that is used in a fee float tube system. But the hand guards are locked in place by the "Delta ring". You twist the ring towards the hand guards to hold them in place or twist the ring towards the upper to remove them.